I wrote this story when the Eastern Shore Art Center paired authors and artists for a show where either the author or the artist took inspiration from the other’s work to complete his own contribution. 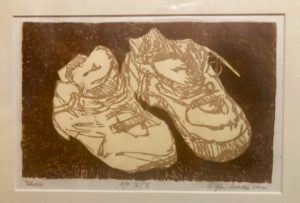 Frankly, I cannot remember whether I looked at John Cleverdon’s woodblock print to write my story, or he read my story and created his artwork. It doesn’t matter. We worked together in some kind of arrangement. This is the only piece of short fiction of mine published in an anthology I had nothing to do with, Climbing Mount Cheaha, edited by Don Noble. I co-edited a college literary magazine, the Southern Bard, and both I and the other editor unashamedly included our own work in the two annual issues we produced. HE WAS ON A NORTHBOUND TRAIN 135 KILOMETERS OUT OF CADIZ, SPAIN WHEN HIS DADDY DIED and a week passed before he got word. Somebody finally thought to send him an email. When he caught the southbound, he took a window seat and slung his backpack on the floor and put his feet on it. He rested his forehead against the frosted glass, feeling all over the buzz of the steel wheels rolling hard on the rails. By the time he got home the old man was in the ground. His house had been cleaned out. Everybody got what they wanted, and it was mostly empty. Figuring the prodigal son was good for a few more years traveling light, he had been left out of the settlement of his father’s things. When his name had come up at the funeral, somebody said it would be a long time before that boy grows up. He went to the house, he did not go to the grave site, and he found the front door unlocked and a FOR SALE sign already in the yard. He looked at the key on the ring snap-shackled to his belt loop and wondered should he leave it on the kitchen counter for the new owners. He decided to keep it. Without the furniture and the curtains, his hollow footfalls down the hallway echoed back at him like the clocking of time toward his own mortgaged future. Sitting on the bed was the last place he’d seen the old man, fumbling to untie the frazzled shoelaces in his Walmart house-brand sneakers. He had spent some time looking at those sneakers the night he left, not wanting to get into it with the old man’s eyes. They could look a hole in you and let all your planning and resolve leak out and puddle up around you. He had nodded slow, noticing the glue was breaking loose on the toe of the left sneaker. His dad gave a soft, sighing groan while bent over tugging off the shoe. He’d let his eyes drift up and the old man’s head was down and his thinning hair drooped like an injured bird’s wing. He watched his father’s head tilt back and his face was blood red, his eyes rising like a gray dawn. Then, enough heard, he had walked out without saying another word into the emptiness. Hit the road. Then he saw them. The door to the closet was ajar and he could see the sneakers at right angles, toe-to-toe, one turned on its side, looking soft like they’d been lived in. After a good deal of walking. The old man always said hell’s a stylish shoe, heels all jacked up and toes squeezed in. “The devil’s own invention,” his father said. Now you are dead and gone, and your shoes are here, he said, and his words strummed the silent walls that seemed to wait for a ballad or a hymn, if only one could be found. He looked around at the emptiness. And the stowaway sneakers. He stared at them, as if they might beckon him, as if he might say something. He thought it odd that he didn’t know what size shoe his father wore. The he kicked off his Birkenstocks and stood barefoot on the floor. 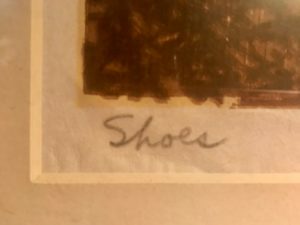 He stepped over to the closet and put his right foot into one of the sneakers and his toes caterpillared in for a perfect fit. He used his left foot to right the other sneaker and slipped into it. He stood there looking at his feet, the sneakers, his sandals. The prodigal son come home, his prize collected now. He would leave his sandals on the kitchen counter. Someone might later say, see what I told you about that kid, and he would be right. Very nice. I think we need to replicate that creative collaboration again at ESAC. I’ve got an idea, Bryant. Call and we’ll talk.